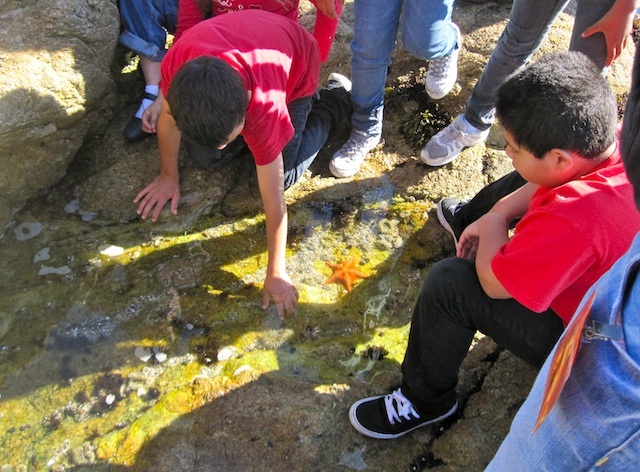 Students carefully investigate a tidepool at Asilomar State Beach. 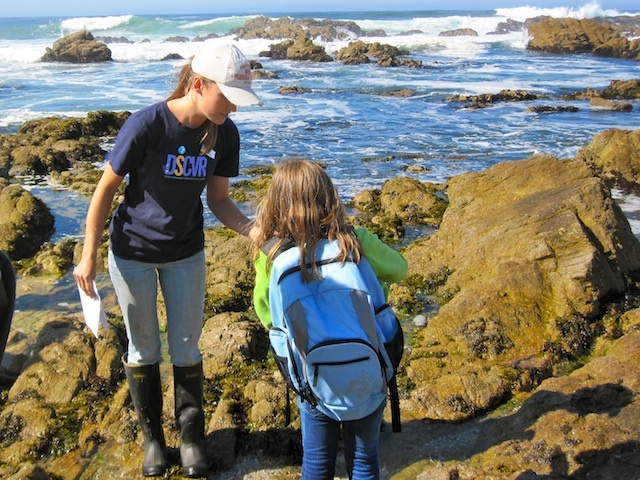 In October, two fellow Moss Landing students and I sprang into action to lead fourth graders on a tidepooling field trip to Asilomar State Beach. Students and chaperones from Ms. Alicia Doolittle’s fourth grade class at Bay View Academy in Monterey enthusiastically participated in the food web interactions lesson and activities prepared and taught by Sara Hutto, Nicole Bobco, and myself. Though we each represent different labs at MLML, we all had a blast instructing and helping students identify organisms and their interactions in the intertidal environment. We were impressed by the students’ knowledge of food webs, and even regaled with a song! The field trip was also a treat for me, as I have not been tidepooling in California in many years, since visiting with family when I was about their age. At the end of the day, it seemed everyone had a great time learning about and exploring the beautiful coastal ecosystems of the Pacific Ocean. Sara teaching a student about intertidal food web interactions. This entry was posted in Diane Wyse, Oh, the Places We Go!, Surviving Grad School, Why Science Generally Rocks and tagged education. Bookmark the permalink.